Face slimming is one of the most popular treatments at our Sydney clinic, especially with our Asian patients. For a beautiful, feminine face shape, like a V shaped face or a heart-shaped face, there should be a curve from upper cheeks to the lower third of the face, rather than a square, round or boxy shape. Face slimming is a simple procedure which is performed every day by our doctors. We are using a muscle relaxant to slim the masseter muscles, which reduces the width of the lower face below the cheekbones. Sometimes masseteric hypertrophy is caused by Bruxism, which is the involuntary or habitual grinding of the teeth, typically during the night. This will cause the masseters to enlarge and if left untreated will cause TMJ dysfunction and orofacial pain. Bruxism is often associated with stress. 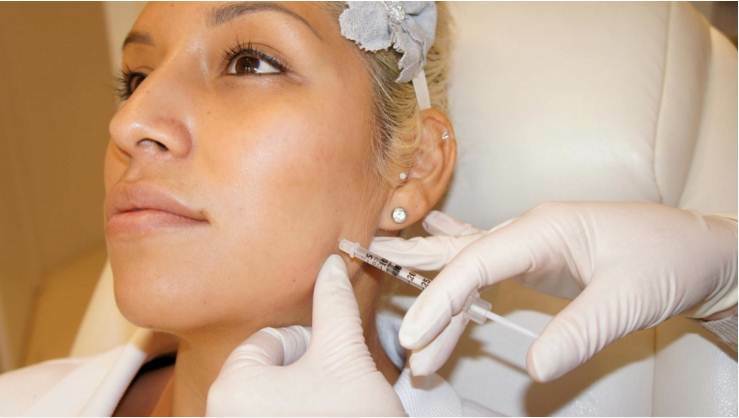 Antiwrinkle injections(due to Australian regulations, we are not allowed to name the drugs) can be used to treat the hypertrophy of the masseter. Sometimes large masseters are genetic, and will run in a family. Small injections with a very fine needle are used to relax and shrink the masseters, causing a slimmed lower face that is more oval and less square appearing. What is bothering the patient? Is it the appearance of a wide or fat face, headaches related to jaw clenching, TMJ dysfunction or orofacial pain. Does the patient have Bruxism ie teeth grinding? Have they worn down their teeth. Does the patient want a more natural appearance, with some squareness left, or do they want the maximal effect possible, ie a face that is super-contoured and as slim as possible ? How is the elasticity of the skin. The doctor will also feel the size and shape of the masseters by getting the patient to chew while touching the masseter area. If the patient has a history of poor longevity, or needing high doses or wanting maximal effect, then a higher dose may be suggested. If the patient is over 40 or has less elastic skin, then a treatment plan, with multiple treatments of smaller doses may be required. What happens during the masseter treatment itself? The doctor will feel the masseter and then inject 1-5 injection sites per side. In general, treatment of the masseters is low risk. Asymmetry: Often one side is better treated than the other, this is usually because the patient is asymmetrical to start with. In some patients they have a much stronger masseter on one side compared to the other. Often it is the side that is favoured for chewing. Who is unsuitable for treatment of masseters? Most people are suitable for masseters, but as stated above, with older patients, a series of treatments should be followed, with smaller doses, so that the jawline will be able to retract. What to expect after face slimming treatment? Mostly immediately after treatment there is nothing to see. Sometimes there can be redness, small lumps, which can look like mild acne and usually resolve quite quickly. The maximal effect of the drug will be at 8 weeks, so a review should not be booked before 8 weeks. If at that time, further treatment is necessary, it should be performed. Photographic evidence of improvement should start to occur at 6 weeks. What do I do if at 8 weeks post treatment one side is better treated than the other or I am not as slim as I want to be? When should I have my next treatment for muscle relaxing injections in masseters? Second treatment should be at 8 weeks if the patient would like the jawline smaller. Second treatment should be at 3-4 months if patient is happy with the amount of slimming at 8 weeks. Over time of regular injecting (approx 2 years), many patients find that they do not need their treatments as regularly or with as high doses. How much does it cost for the muscle relaxing injections in masseters for jawline slimming? $360-$1150, it will cost less if combining with treatment using the same drug in other areas of the face. Commonly in the reducing phase of treatment, cost is approx $730-$830. Maintenance after 2 years of regular injecting may be less. Please see antiwrinkle injecting prices.